Kauaʻi, anglicized as Kauai [a] (English: /kəˈwaɪ.i/; Hawaiian: [kɐˈwɐʔi]), is geologically the oldest of the main Hawaiian Islands. With an area of 562.3 square miles (1,456.4 km2), it is the fourth-largest of these islands and the 21st largest island in the United States. 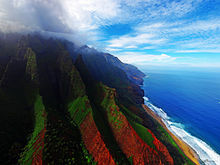 Known also as the "Garden Isle", Kauaʻi lies 105 miles (169 km) across the Kauaʻi Channel, northwest of Oʻahu. This island is the site of Waimea Canyon State Park. The United States Census Bureau defines Kauaʻi as census tracts 401 through 409 of Kauai County, Hawaiʻi, which comprises all of the county except for the islands of Kaʻula, Lehua and Niʻihau. The 2010 United States Census population of the island was 67,091. The most populous town was Kapaʻa. Valdemar Emil Knudsen was a Norwegian plantation pioneer who arrived on Kauai in 1857. Knudsen, or "Kanuka", originally arrived in Koloa where he managed Grove Farm, but later sought a warmer land and purchased the leases to Mana and Kekaha, where he became a successful sugarcane plantation owner. Knudsen settled in Waiawa, between Mana and Kekaha, immediately across the channel from Niʻihau Island. His son, Eric Alfred Knudsen, was born in Waiawa. Kauaʻi was known for its distinct dialect of the Hawaiian language; this survives on Niʻihau. 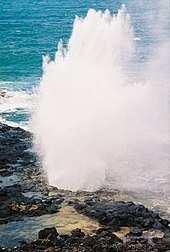 While the standard language today adopts the dialect of Hawaiʻi island, which has the sound [k], the Kauaʻi dialect was known for pronouncing this as [t]. In effect, Kauaʻi dialect retained the old pan-Polynesian /t/, while "standard" Hawaiʻi dialect has changed it to the [k]. [ clarification needed] Therefore, the native name for Kauaʻi was said as Tauaʻi, and the major settlement of Kapaʻa would have been pronounced as Tapaʻa. The second highest peak is Mount Waiʻaleʻale near the center of the island, 5,148 ft (1,569 m) above sea level. One of the wettest spots on earth, with an annual average rainfall of 460 inches (38.3 ft; 11.7 m), is located on the east side of Mount Waiʻaleʻale. The high annual rainfall has eroded deep valleys in the central mountains, carving out canyons with many scenic waterfalls. On the west side of the island, Waimea town is located at the mouth of the Waimea River, whose flow formed Waimea Canyon, one of the world's most scenic canyons, which is part of Waimea Canyon State Park. At three thousand feet (910 m) deep, Waimea Canyon is often referred to as "The Grand Canyon of the Pacific". Kokeo Point lies on the south side of the island. The Na Pali Coast is a center for recreation in a wild setting, including kayaking past the beaches, or hiking on the trail along the coastal cliffs. The headland, Kuahonu Point, is on the south-east of the island. As of mid-2004, the median price of a single-family home was $528,000, a 40% increase over 2003. As of 2003, Kauaʻi's percentage of home ownership, 48%, was significantly lower than the State's 64%, and vacation homes were a far larger part of the housing stock than the Statewide percentage (Kauaʻi 15%, State 5%). The housing prices decreased significantly in 2008. As of Spring 2014 the median price had risen to about $400,000. Kauaʻi is home to the U.S. Navy's "Barking Sands" Pacific Missile Range Facility, on the sunny and dry western shore. HF (" shortwave") radio station WWVH, sister station to WWV and WWVB in Fort Collins, Colorado, is located on the west coast of Kauaʻi about 3 miles (5 km) south of Barking Sands. WWVH, WWV and WWVB are operated by the US National Institute of Standards and Technology, broadcasting standard time and frequency information to the public. 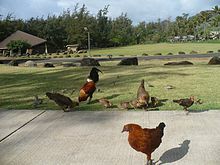 Kauaʻi is home to thousands of wild chickens, or moa in Hawaiian, who have few natural predators, as the mongoose was never introduced in Kauaʻi as it has been on other Hawaiian islands. Kauaʻi's chickens originated from the original Polynesian settlers, who brought them as a food source. They have since bred with European chickens that have gotten free from farms and cockfighting breeders. The island of Kauaʻi has been featured in more than seventy Hollywood movies and television shows, including the musical South Pacific and Disney's 2002 animated feature film Lilo & Stitch along with its franchise's three sequel films (2003's Stitch! The Movie, 2005's Lilo & Stitch 2: Stitch Has a Glitch, and 2006's Leroy & Stitch) and first television series ( Lilo & Stitch: The Series). Scenes from South Pacific were filmed in the vicinity of Hanalei. Waimea Canyon was used in the filming of the 1993 film Jurassic Park and its 2015 sequel Jurassic World. Scenes from the 2016 comedy film Mike and Dave Need Wedding Dates were also filmed. Parts of the island were also used for the opening scenes of the Indiana Jones film Raiders of the Lost Ark. Other movies filmed here include Six Days Seven Nights, the 1976 version King Kong  and John Ford's 1963 film Donovan's Reef. Recent films include Tropic Thunder and a biopic of Bethany Hamilton titled Soul Surfer. A scene in the opening credits of popular TV show M*A*S*H was filmed in Kauaʻi (helicopter flying over mountain top). Some scenes from Just Go with It, George of the Jungle and Pirates of the Caribbean: On Stranger Tides were also filmed in Kauaʻi. A Perfect Getaway is set in Kauaʻi. ^ E. Gering; M. Johnsson; P. Willis; T. Getty; D. Wright (March 6, 2015). "Mixed ancestry and admixture in Kauaʻi's feral chickens: invasion of domestic genes into ancient Red Junglefowl reservoirs". Molecular Ecology. 24: 2112–2124. doi: 10.1111/mec.13096. PMID 25655399. our data support the hypotheses that (i) Kauaʻi's feral G. gallus descend from recent invasion(s) of domestic chickens into an ancient Red Junglefowl reservoir and (ii) feral chickens exhibit greater phenotypic diversity than candidate source populations.